Spartan IRIS HORNSEY is a world champion at 800 and 1500 metres. She also took bronze in the 400 metres. 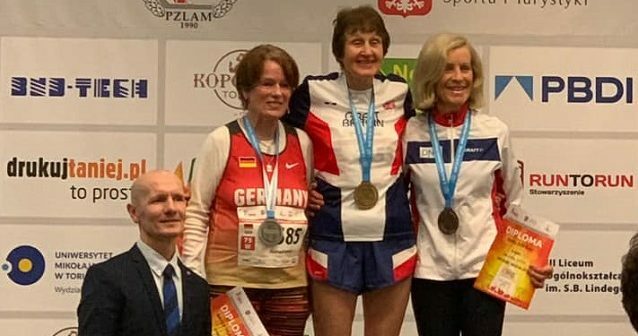 At the World Indoor Masters Track and Field Championships in Torun, Poland Iris won the BRONZE medal for women 75 plus in the 400 metres with 1 minute 24.16 seconds (84.16) then moved up to GOLD in the 800 metres with 3:55.07 and GOLD in the 1500 metres with 8:04.42. Both wins were by a comfortable margin of seven seconds over second placed Milena Hovorkova of the Czech Republic. Andrea Westcott was eighth in W45 (women 45 plus) Pentathlon. She achieved new personal bests (PB) in four of the events and smashed her points PB for the whole event, scoring 1625 points. Four Spartans won categories in the multi-distance Running Grand Prix at Bedford Autodrome on Sunday morning. In the half marathon KELLY McHALE beat the conditions to get under two hours with 1:59:26. The 20 mile race was a popular option as many prepared for Spring Marathons. CATHY CRAIG won the women’s 65 plus contest in 3 hours 50 minutes 1 second. The fastest Spartan was ED HARE, third male 35 plus in 3:08:59. MEGAN TAYLOR came in with 3:16:54 and JULIE SHADBOLT was third woman 50 plus in 3:19:39. Five Spartans tackled the 16 miles option. HAZEL SMITH was first woman (40 plus) in 2 hours 40 minutes 37 seconds. PAUL SHELLEY was first in for the club at 13th in 2:10:00 exactly with RICHARD COWLISHAW 14th in 2:11:08. CLAIRE EMMERSON was second woman (45 plus) in 2:20:25 and ALISON SHELLEY came in with 2:36:18. ANTON McCALLA took part in the very flat, fast and windy 10K race and achieved his best 10K time for many years of 54:04. KAREN BROOM was very happy with her 1:00:15 in the same race. TREVOR BROOM took a minute of his 5K personal best with 28:46. NICOLA PATTMAN ran the 5K at Bedford aerodrome and gained her first sub 30 personal best (PB) of 29.07! CHLOE EMMERSON came in with 31:08 for the 5K. JENNY GARRETT used the event for a 10.6 miles training run. SALLY HARRIS ran at Braintree Five on Sunday with at time of 49:20. The course was a one lap route of undulating countryside roads starting and finishing at the race course. No medal but a nice T shirt was on offer to all finishers. Mylo and MARIA SWIFT took part in the ‘female with one dog’ Canicross Category at the stunning Grantham 10K on Sunday 31st March, and they came fourth in their category. She highly recommends this event if you wish to take part in a beautiful off road 10K, with some stunning views and a couple of cheeky hills in it. You also get to spend the day at The Belton Horse Trials as it all takes part in the same venue. ROGER BIGGS was in the Welsh coastal town of Llandudno for the inaugural Conwy Marathon. Starting by circling the “Great Orme”, this was certainly a scenic marathon, but of course scenic usually means hilly and sure enough! Roger had a hard day to finish last in a time of 6:37:37. The only consolation was that he has now completed a marathon in 96 Counties in the UK & Ireland, with four others planned. Lunch-time conditions were great for the Last Friday of the Month 5K round the Serpentine in Hyde Park, London. It was sunny, mild with a light breeze as the host club welcomed Spartan YUKO GORDON, who topped this month’s age gradings with 93%. Yuko ran in the Marathon in the 1984 Los Angles Olympics and placed second in the 1985 Asian Marathon Championships. She finished in 22 minutes 5 seconds. JIM BROWN was third man (65 plus) in a year’s best 24 minutes 34 seconds. Spartan times at the recent London Landmarks Half Marathon included NEAL MUGGLETON in 2 hours 3 minutes 11seconds; HAZEL SMITH in 2:03:13 and JODY HANAFIN in 2:07:15. A while ago NICHOLA DURENT did her first race as a Spartan at the Welwyn 10K. Her time was 1:24:23. GERRY ROSEN took part in the Dorney Lake marathon training event. He ran 16 miles in an unofficial 3 hours 2 minutes 10 seconds. 36 Spartans ran Parkrun on Saturday, across 11 separate locations. 5 PBs were achieved, including John HARRIS with his 3rd successive PB in three weeks (20:44). Other PBs included David PATTMAN (22:06), Lee PICKERGILL (22:23), Nick KLEANTHOUS (26:00), Karl SHREEVE (27:08). Fastest male Spartan was John Harris at Letchworth in 4th place, fastest female was Louise PACK (25:32) at Stevenage as 12th female finisher. Congratulations to Maria THORNE (27:14) on her first Parkrun. She finished Gorleston Cliffs, in 148th overall place in a field of 383 runners (22nd female). Full Spartan Parkrun results can be found near the end of this release. Fairlands Valley Spartans are into week thirteen of their marathon training plan. Are you running a Spring marathon? Whether you want to get round and enjoy; are a first timer; want a personal best or expect to go “Sub Three” the Spartans are the local club for you, there are group training opportunities five days a week. Have a look at www.fvspartans.org.uk or the club’s Facebook page. Letchworth 4 4 John HARRIS 20:44 PB (PBs in last three successive runs). Fastest male Spartan. Stevenage 91 12 Louise PACK 25:32 Fastest female Spartan. Gorleston Cliffs 148 22 Maria THORNE 27:14 First Parkrun! Preston Park, Brighton 324 228 Michael O’KEEFE 27:45 1st run at Preston Park.